Two real beds, instead of 1 bed and 1 sofa bed, for our group of 4. The rooms are good in size. 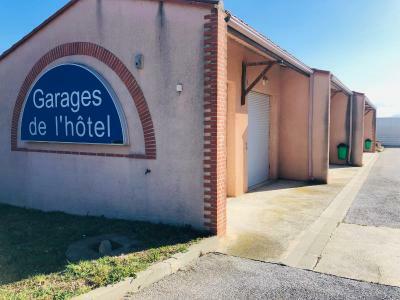 The location was good and the secure garage was worth paying for. The room was clean. Excellent location for car travellers. All essentials available. 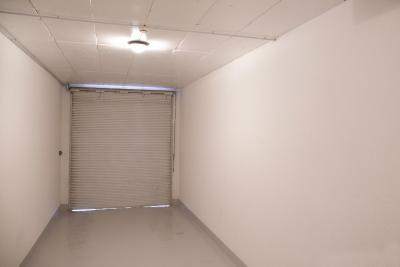 Individual garage with direct access to room - excellent! 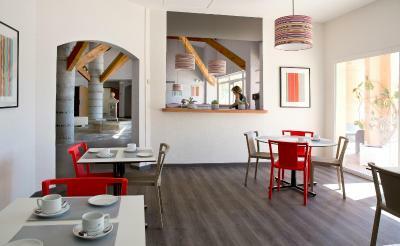 Great breakfast as of 7 am - good for busy travellers. Also very suitable for traveling with dogs! 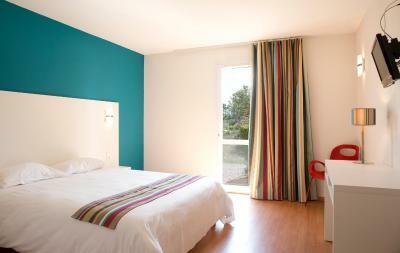 Clean, modern, nice views, friendly staff, very very comfortable bed. Pool which we have used previously is very nice but closed in off season. It was a very cold wintry day when we arrived and the hotel was so cosy and clean and comfortable and a garage so big and roomy was so good. We love the fact that we can park the car in the garage joining our room we don't have to worry about it. We love village Catalan. The car was secure in the garage. The sheer experience of it. 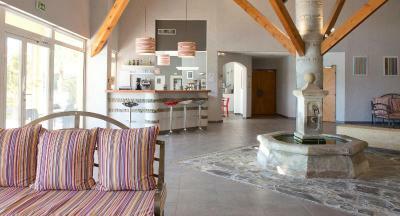 However at 200 euros for a night we could have stayed somewhere seriously plush. 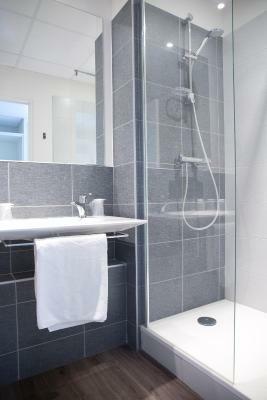 Clean, good for pets on ground floor. No facilities in room though, would have been nice to have a coffee / tea facilities. 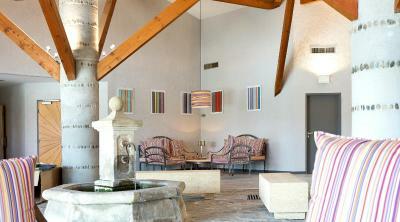 This hotel welcomes you in its lovely setting among the vineyards of Catalan and the Pyrenees Mountains. 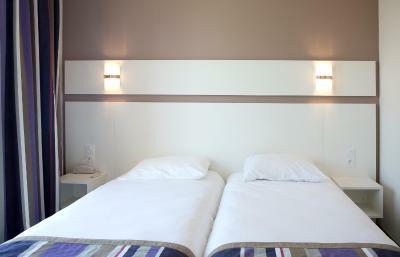 It offers comfortable and quality accommodations. 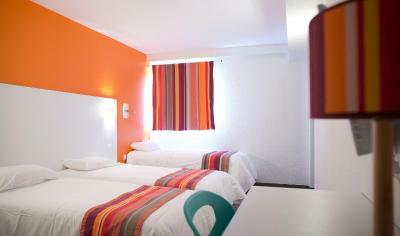 The Hotel du Village Catalan is located at the motorway A9 between Perpignan and the Spanish border. 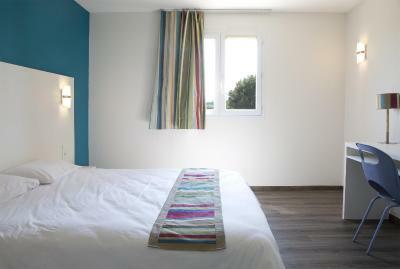 Guestrooms are spacious, bright, soundproofed and air-conditioned to provide you with a relaxing living space. 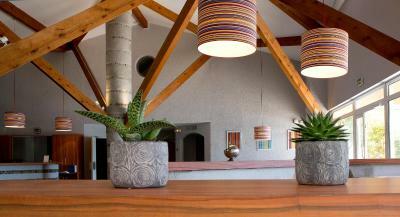 Wi-Fi internet access is available in the hotels public areas and is free of charge. The spacious pool of the Hotel du Village Catalan is set in a beautiful garden promising relaxing moments for the whole family. 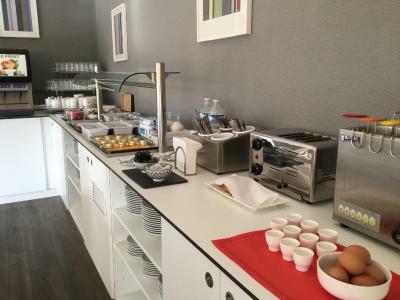 Also, guests will enjoy a continental breakfast served in the air-conditioned breakfast room or on the shaded terrace by the pool. Private parking in garages is available at an additional cost. 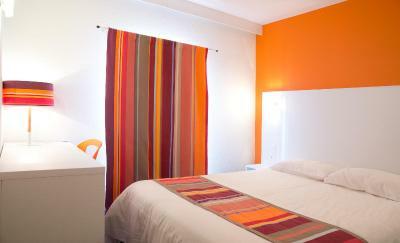 When would you like to stay at Hotel Du Village Catalan? 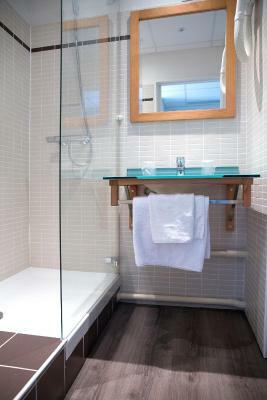 This air-conditioned room features a TV and a private bathroom with a bath or shower. It also includes a private garage. 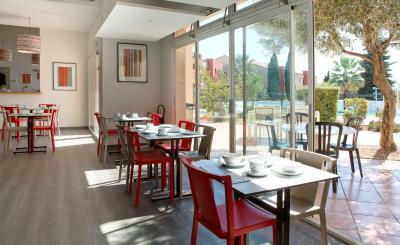 House Rules Hotel Du Village Catalan takes special requests – add in the next step! 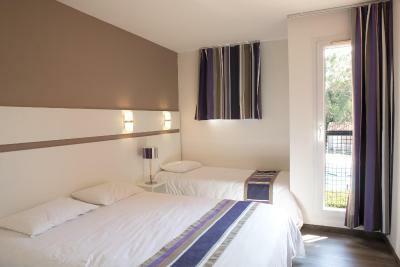 Hotel Du Village Catalan accepts these cards and reserves the right to temporarily hold an amount prior to arrival. 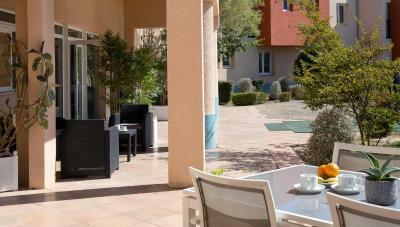 Guests wishing to use the private garages should contact the hotel in advance. Contact details can be found on the booking confirmation. 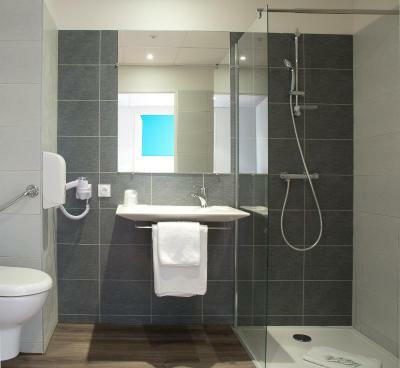 The bathroom is quite small. The air condition did not work - it was uncomfortably hot. A bit pricey. 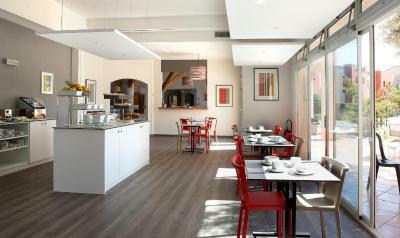 Offered unlimited free coffee on arrival, had two coffees the following morning for which staff attempted to charge us. 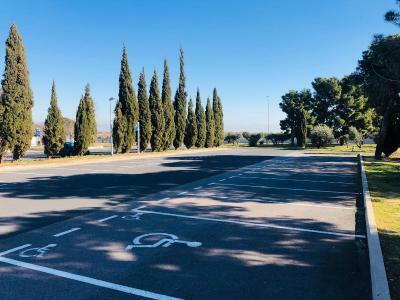 Ticked free secure parking when booking, charged €15 for garage on arrival. Garage the only secure option. Vehicles in that area regularly get turned over, recommend you get a garage or empty your car. Not enough pillows and not comfortable. Had to pay extra for a cup of coffee, should have facilities in room. The bathroom smelt and was tired. The room was bare, a double room should have two chairs, not just one - the room was spartan and utterly soulless. The bed smelt of stale tobacco smoke. Another pillow on the bed. 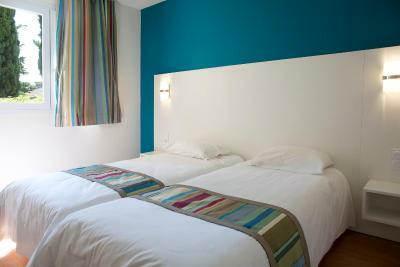 I did not realise when I was booking this that it was a hotel on a motorway service station. The pictures made it look much lovelier than it was. Eating options : at the motorway service. This was an experience in itself. 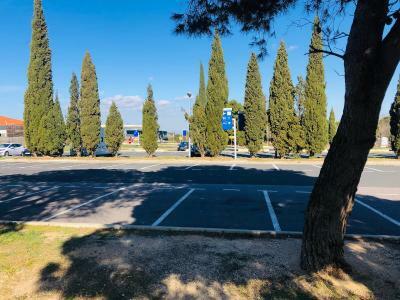 Hugely expensive (it was the only place available in the area) Do your research before booking this and ask yourself - do you really want to stay at a motorway service station at a very high cost. Bed only. No tea or coffee making equipment in rooms. No bar which is a shame, it has a nice outdoor area in which to sit and sip. No tea / coffee facilities room.